Sheriff, Ralph Cleveland Freeman, 91, died Friday, February 1, 2019. Born in Society Hill, SC he was a son of the late James Austin and Lena Pearl Wilkes Freeman. He was the widower of Grace T. Freeman. 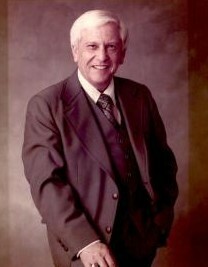 He was Sheriff of Chesterfield County from 1975 to 1994. Sheriff Freeman was a past President of the South Carolina Sheriff’s Association 1988-1989 and was Sheriff of the Year for the state of South Carolina in 1988. He was also retired (with 25 years of service) from the South Carolina Highway Patrol. Sheriff Freeman was a US Navy Veteran. He enjoyed hunting, fishing and lifting weights. Surviving is his son, Ralph Cleveland “Jay” Freeman, Jr. of Columbia, SC, daughters, Pamela “Pam” Whitley of Greensboro, NC, Mary Margaret (Lee) Snipes of Raleigh, NC, grandchildren, Meg Rogers, (Justin Everette), Justin Anne (Drew) Patterson, great grandchildren, Benjamin Cash Rogers and Mason Alexander Everett. The family will receive friends 1:00 PM to 2:00 PM, Monday, February 4, 2019 at Kiser Funeral Home, Cheraw, SC. A funeral service will be held 2:00 PM, Monday, February 4, 2019 at Kiser Funeral Home, Cheraw, SC. Burial with honors will be in Chatham Hill Memorial Gardens, Cheraw, SC. Memorials to: SC Sheriffs' Association Fallen Heroes Fund, PO Box 21428, Columbia, SC 29221 or Hospice of Wake County, 60 Wheaton Ave, Youngsville, NC 27596.